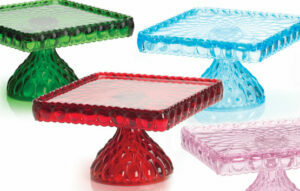 Mosser’s cake stands have elegant designs for displaying wonderful creations. Styles include the classic Plain, Elizabeth and cake plates within Mosser glass pattern designs like Inverted Thistle. Mosser’s model 24010J cake plate #4 in Ezvid Wiki’s 2016 Best Cake Plate. Enhance any kitchen with these high-quality mixing bowls. Go from batter to sauces to serving with different sizes of bowls. 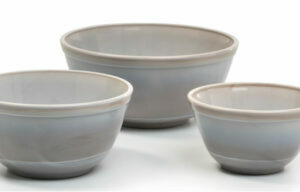 Mosser Mixing Bowls come in Robin Egg Blue, Butter Cream, Black Raspberry, Crown Tuscan, Jade, Marble and Milk. Our beautifully colored tableware brings warmth and appetizing ambiance to every meal. 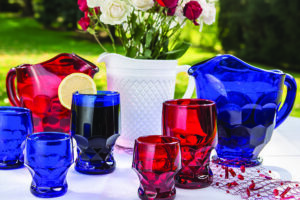 The glassware’s intricate designs are handcrafted in America and display a refined look and feel. Choose from our wide selection of specific products with various colors, patterns and adornments to fit the mood and menu. Mosser’s dazzling pitchers have a lovely custom moulded rim and thick handle that feature a gorgeous cut glass design around its surface and base. From modern Georgian to vintage Dahlia, there’s a style and color for every occasion. These romantic vintage lamps provide a stylish and antique feel to your home. With the options of electric or oil, these lamps and shades, adorned with detailed floral designs, could be a perfect gift for a loved one this season. Entertain with a touch of class with our beautiful assortment of punch bowls and spooners. 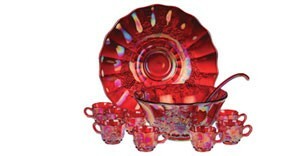 Our brightly colored and iridescent glassware adds a bit of flair to your beverage selection, so delight guests with the full collection of punch bowl, plate, ladle and cups of the Mosser Grape Punch Set. 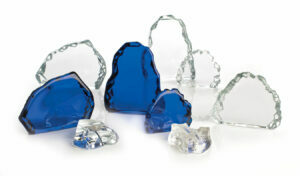 Adorn any table or shelf with our delicately moulded glass baskets. 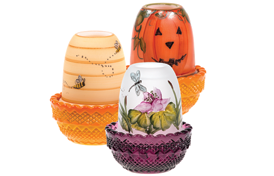 Coming in either Thistle or Drape styles, these decorations offer a great conversation piece when guests grab for candy or comment on perhaps the lovely flowers it holds. 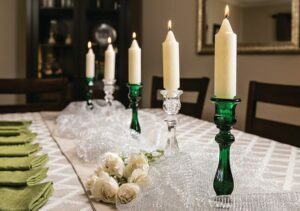 Awe your guests as they walk into the room to see your dining room table decorated with these beautifully designed candleholders. These colorful centerpieces come in classic crystal, cobalt, red, and ever-popular jade to give the room and meal an elegant feel. These whimsical glimmer lights provide a playful brightness to any room or setting. Get in the spirit with seasonal themes such as spring flowers, Fall and Halloween designs, and Christmas classics of Santa and Frosty. ‘Tis the season to deck the halls with Mosser holiday collectibles. 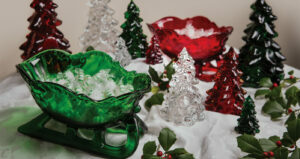 Some products like our gorgeous glass sleighs and angels provide winter merriment to all who see them. The reindeer goblets and paperweights also make for perfect gifts to spread the holiday cheer! The animal lovers in your life will find great enjoyment through these beautifully made figurines. Hand crafted and in an assortment of colors, our collections include cats, dogs, birds, bunnies and even turkeys to decorate for Thanksgiving. From simple round crystal to cobalt jagged rocks; our collection of glass paperweights provides a variety of selections for you to choose from. You could also get these engraved as great corporate gifts or party favors!